We are surrounded by politics and no organization is immune from politics. 2. the total complex of relations between people living in society. My research group does a lot of work on disaster planning, emergency preparedness, and humanitarian operations with coverage of our most recent study being featured on newswire.com in an article entitled, Team Designs Optimal Supply Chains for Disaster Relief. With the number of disasters growing as well as the number of people affected by disasters, the question arises as to what role politics play in disasters when it comes to the survival of citizens after disasters strike. In a democracy, leaders must maintain the confidence of large portions of the population in order to stay in power. To do so, they need to protect the people from natural disasters by enforcing building codes and ensuring that bureaucracies are run by competent administrators. When politicians fail to deliver -- by, for example, letting too many die in disasters -- they lose their jobs. On average, 39 percent of democracies experience anti-government protests within any two-year period. The rate almost doubles after a major earthquake (defined as one that results in more than 200 casualties). And whereas 40 percent of democratic nations replace their leader in any two-year period, between 1976 and 2007, 91 percent of them did so following a major earthquake. The article also highlights the difference in outcomes in countries post disasters: On January 12, 2010, Haiti’s capital, Port-au-Prince, was struck by a 7.0-magnitude earthquake that caused widespread destruction and killed approximately 222,000 people. The next month, Chile was hit by an 8.8-magnitude earthquake -- approximately 500 times stronger than that in Haiti -- but only 500 people died. The difference in losses (both in terms of lives lost and infrastructure destruction, which in the case of Haiti propagates to this day) was attributed to several factors: the difference in the building codes in these two countries and the government response to the earthquakes. The difference is also in the preparation: Chile, Japan, and the United States have implemented policies that keep acts of nature from becoming massive human tragedies, while others have not (and some of the most notable ones of the latter have been non-democratic countries). I recall when I was at the Rockefeller Foundation's Bellagio Center on Lake Como, Italy, as organizer of the Humanitarian Logistics: Networks for Africa conference, which was "sandwiched" between (obviously, not planned) Cyclone Nargis that hit Myanmar (Burma) and the Sichuan Earthquake that hit China. There were several conferees in attendance who are well-known to the operations research community. While at Bellagio, we were told by Dr. Cosmas Zavazava of the International Telecommunications Union (whose UN-based organization also played an important role in restoring communications in Haiti after the earthquake) the difficulties that ITU had in getting its equipment to where it was needed in Myanmar because of the political situation (and he was in regular communication providing assistance while at the conference, which he deemed so important that he had to attend it). George Fenton of the World Food Program, another invited conferee, managed to send us his presentation but was en route to Myanmar. The death toll following Cyclone Nargis was 138,000. As highlighted in Disaster Politics: Not only did the military regime do virtually nothing to help the communities worst affected it also blocked the arrival of international aid. The casualties were two orders of magnitude greater than those from Hurricane Katrina, but Myanmar’s military regime remains firmly entrenched. We have a responsibility to educate and to inform citizens living under different political regimes that their governments must be prepared for disasters and must invest in resilient infrastructure to minimize the potential devastation. We have the knowledge to identify where to build (and how) so as to minimize risk; where to position necessary supplies in case of emergencies so that life-saving products can be delivered in a timely manner to population centers, and how to prioritize. We have the tools and techniques that can identify how organizations can team up during disasters in order to identify potential synergies so that lives are saved through cooperation rather than competition. Equally importantly, we must work to ensure that the actions of humans do not add to the potential devastation whether through climate change or inappropriate and inadequate resource allocation. The 2011 Bay State Winter Games are now taking place at Williams College in Williamstown, Massachusetts in the Berkshires. Today is the last day of the three day figure skating competition. We spent the entire day yesterday there since our daughter was competing in two events. This year, not only were Massachusetts skaters invited to compete but also skaters from other New England states who do not host their own state games. There are about 450 who registered. The weather was great and it was wonderful to see so many athletes, their coaches, families, and supporters. We enjoyed watching the skaters, walking through the small downtown with surprisingly wonderful restaurants and cafes (I recommend the bakery at Tunnel City cafe with exquisite treats that reminded me of Paris)! Williams College, one of the top liberal arts colleges in the United States, was also bustling with other events, including a female basketball game vs. Middlebury. Figure skating is a very challenging sport since it demands incredible discipline and athleticism, but also artistry and musicality. The competitive level was very high this year, which speaks well of this sport. There is also drama associated with this sport from a skater we saw whose hand touched her blade while skating her program and then had to be treated when she got off since she was bleeding (some seemed more worried about her skating dress, though, than her well-being). There were also tears among some of the competitors when they did not do as well as they had hoped. But they did their programs and competed and deserve applause for trying to do their best! Some skaters were scheduled to skate in more than a single event so the waiting can be taxing and enervating. I suspect that skaters handle the waiting better than their parents! One is also always curious about the size of the flights (that is, the number that one gets to compete against) and over the years, the skaters who stick with this beautiful but difficult sport, get to know one another and to remember the results from various competitions over the years. What I continue to find fascinating is who sticks with this sport, despite the dedication required, the difficulties associated with it, not to mention the cost. It is breathtaking to watch -- will the skater land the double jump? Will she (most of the skaters were female at this competition) do all the jumps and spins in her program? And even, will she be able to go on the ice to compete (we have seen some who, literally, were too frozen in fear to get on the ice in previous competitions). In this sport (unless one is doing dance or pairs) one is literally alone on the ice with the judges and spectators' eyes staring at you and one can't hide! A former MBA student of mine, who is an auto executive, and who (I get the most interesting students, I must say) was also a competitive figure skater, sent me an email recently -- he asked me whether I am one of those mothers who can't watch their child compete (indeed, I am, but I am getting better and can now sneak a peak at the beginning of my daughter's program and towards the end). Congratulations to all the skaters who competed at the 2011 Bay State Games at Williams College and thanks to the organizers for a wonderfully run event! Thanks also to the coaches who nurture their students and who help them to achieve their dreams! And, yes, my daughter qualified for the State Games of America that will take place in the summer of 2011 in San Diego, California! The competition was tough but she loves this sport and that is what really matters! I caught the 3PM flight out of Reagan National Airport yesterday as many of the later flights were being canceled. I had the pleasure of having our congressmen, Richard Neal and John Olver, being on the same flight so I figured that we would make it to Bradley airport on time and we did (Thanks to Republic Air / USAIRWAYS)! I had flown to DC for the Transportation Research Board (TRB) meeting to speak on a panel (appropriate title, I might add -- see below). This TRB annual meeting had attracted 10,000 transportation professionals from around the globe. This past Wednesday I arrived to no snow and 45 degree temperature with joggers in shorts! What a difference a day made! Thundersnow arrived yesterday shortly after our plane took off and paralyzed DC after 4PM! The Washington Post is reporting that it took some commuters 13 hours to make it home! People were stuck for hours on the parkway with The Post calling the gridlock -- traffic anarchy! And less than 24 hours before, President Obama had given his State of the Union speech in DC! The panel and discussions were fantastic and I took copious notes. As the panelists noted, one never knows when the next disaster will strike (with the snowstorm unveiling before our eyes shortly thereafter). The interconnectedness of our critical infrastructure systems was also emphasized (and 422,000 lost power yesterday on the DC area because of the snowstorm)! We are truly in the era of supernetworks! Since I have had requests, I have posted my presentation on this link. And, yes, I mentioned the price of anarchy for traffic in my talk and how it is related to the indices that we have developed in our research to identify the most critical nodes and links in various network systems from transportation ones to the Internet, electric power networks, and even financial ones. I wish all the TRB conferees safe travels back to their homes! It was great to see so many wonderful colleagues from throughout the US and abroad in DC! My suitcase is packed and I will soon be leaving for Washington DC where I will be speaking on an invited panel tomorrow morning at the Transportation Research Board meeting. Tonight I will be watching President Obama's State of the Union speech in DC. There is great anticipation surrounding his speech and newspapers and bloggers are writing about what they believe that the citizens need to hear -- clearly the country is starving for energizing, positive leadership that will coalesce the strengths and work ethic of its people and that will build upon collaboration and creativity. Competitiveness is being highlighted as well but with an entirely different slant. The new sort of competition is all about charisma. It’s about gathering talent in one spot (in the information economy, geography matters more than ever because people are most creative when they collaborate face to face). This concentration of talent then attracts more talent, which creates more collaboration, which multiplies everybody’s skills, which attracts more talent and so on. The nation with the most diverse creative hot spots will dominate the century. He then argues that the President of our nation is like the President of a University (coincidentally, UMass just named its new President, Dr. Robert L. Caret) and although the President lives in the "big house" it is the professors, the researchers, the tutors, the coaches and the students that are the real guts of a university. They handle the substance of what gets done. The administrators play vital but secondary roles. They build the settings. They raise money. They recruit and do marketing. They help students who are stumbling. The administrators couldn’t possibly understand or control the work in the physics or history departments. They just try to gather talent, set guidelines and create an atmosphere where brilliance can happen. This is what outstanding administrators do, I might add, and we certainly need such talented individuals since incompetent, negative ones can seriously damage, impair, and even destroy an organization. Leaders are desperately needed who can create an environment in which talent is nurtured, supported, and in which laudatory efforts and successes are rewarded and recognized (sometimes a public compliment is worth more than a few dollars in one's paycheck and why is it difficult for some managers to do this?!). So it is with government in an innovation economy. Entrepreneurs, corporate executives, line workers and store managers handle the substance of the economy. Government tries to nurture settings where brilliance can happen. Yesterday, a female undergraduate student, who is an Operations Management major, came to my office to chat and we spoke for about an hour and a half. She and I concurred that the time just flew by (but she had to go to a class and I had to go teach a class). We spoke about her family, her courses, her major and dreams, and about the course that she took from me last semester. She told me how she is looking at the world in a different way because of my course (Transportation & Logistics). This was such a compliment and I couldn't be prouder of my students -- from the projects that they do to the jobs that they aspire to obtain to the positive role models that they are for the younger students. The Transportation Research Board Annual Meeting has now begun in Washington DC and I am very pleased to see coverage in The New York Times. Today, it is reporting on the finalists and the winner of a design competition to help animals in crossing a road in Colorado. According to the article: At a picturesque spot in the mountains near the ski resorts of Vail and Breckenridge, Colo., two streams of traffic converge: people driving east and west on Interstate 70, and animals — black bears, cougars, bobcats, elk and deer — headed north and south to feed and mate. When they collide, the animal is almost always killed and the vehicle badly damaged, even if the driver is lucky enough to escape injury. This is an example of multimodal/multiclass transportation and I will definitely bring it to the attention of my students since transportation need not just be about moving people and products! The winner of the animal design crossing is Michael Van Valkenburgh & Associates, a landscape architecture firm with offices in New York City and Cambridge, MA. The design team, associated with the national construction firm HNTB, submitted a proposal for a bridge made of lightweight precast concrete panels that are snapped into place and covered with foliage. The award is for $40,000. In Amherst, the "wildlife" crossing design is in the form of tunnels and this initiative (without any financial incentives, I might add) was initiated decades ago, to assist salamanders crossing Henry Street so that they could mate. The New York Times reported on this crossing, with human intervention, back in 1988.
Who knows if the winning animal bridge design will actually be implemented in Colorado. In Amherst, the town actually built two tunnels decades ago and the salamander crossing has become an annual town event! What our town did is even reported on the U.S. Department of Transportation Federal Highway Administration website, complete with photos of salamanders! The tunnels were made possible through the efforts of the Amherst Department of Public Works, UMass Amherst, the MA Audubon Society, the Hitchcock Center (where my daughter and many others volunteer), and local residents. 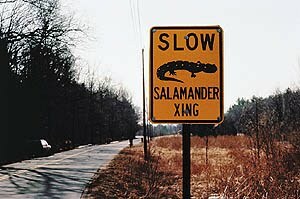 See the photo above of the salamander crossing sign, which is a short walk from our home. "It was one of the best nights of my life," my daughter said yesterday and her day began by showing up at 7:30AM to take the SATs. It was also a day that my husband and I attended a college counseling session (very well-done, I must say) at Deerfield Academy. But last night will be a night we will long remember. It was the night of the Choate vs. Deerfield hockey game at Deerfield and these two prep schools are historically big rivals. Also, our daughter had been asked (it was suggested as early as last year) to skate during the second period break and she had received permission from U.S. Figure Skating to put on a performance. We had entered the rink (honestly) to the smell of bacon cooking outside in single digit temperatures (Deerfield folks will understand) and one could hear the cheering from the fans outside. I have never been at an event at which there was so much school spirit -- it was truly extraordinary to experience and so much fun -- from the students jumping in unison in the bleachers to the hockey players being high fived going on and off the ice by other sports team members (I think -- lacrosse especially with notable enthusiasm) to fans of all ages from little kids to friends in wheelchairs. Some students were selling hot chocolate and everyone was so engaged! My daughter's wonderful skating coach came to put her on the ice and to support her, as did her husband, who had been a youth hockey coach for years and is a graduate of the UMass School of Management, where I teach. Luckily, my daughter's skating dress is green (Deerfield's school color with the motto -- Bleed Green) and she was welcomed with such cheers onto the ice. She skated with pure happiness (without even a warmup and on hockey ice) and the experience was simply fantastic. If only all schools at all levels could engender such mutual support of their students with such tremendous school spirit -- think what the world could accomplish! And Deerfield Academy beat Choate in overtime with a score of 4-3! I have not yet read Amy Chua's book, Battle Hymn of the Tiger Mother, but even my daughter's English class got to read Janet Maslin's review of it in the New York Times last week. From the experience that so many of us had last night it is clear to me that children can succeed and have a fabulous time on their journeys as children with the support of their schools and the community cheering them on! Above I have posted some photos from last night's game that capture the spirit and the fun of the event. I would also like to add that Choate played extraordinarily well and the game was a heart-stopper! Thanks to all concerned -- from the terrific coaches to the extraordinary teachers, the truly kind and thoughtful staff, and the wonderful administrators as well as to the super students -- for the fantastic memories! The hockey refs even high-fived my daughter when she finished her program! Jane Garvey, Lifetime Achievement Award in Transportation, and O.R. (at which about 10,000 transportation professionals are expected) with the Frank Turner Medal for Lifetime Achievements in Transportation. Turner was the architect of the federal highway system. Garvey, who began her career as a junior high teacher in South Hadley, having majored in English, and after a receipt of a Master's from Mount Holyoke, became involved in local political campaigns. She then became head of the State Department of Public Works (DPW) (now called the Department of Transportation) and, although not an engineer, gained the confidence of the employees. According to the Amherst Bulletin, Garvey is quoted as saying: I think one of the lessons I learned from [former state Secretary of Transportation] Frederick Salvucci is that when you come to an organization ... you spend a lot of time listening to employees. You identify a couple of things where you can really go to bat for them. After being Commissioner of the DPW, she became the head of Logan Airport for two years. She then became the first female Director of the FAA, where she served from 1997-2002. During her tenure there, she handled two major events, the new millennium and the Y2K scare, plus the terrorist attacks of 2001. It was Garvey's task to help land 4,923 planes that were in the air over the United States after the attacks. According to the Amherst Bulletin, Garvey said: When I look back at it, I am always grateful and extremely impressed that the air traffic controllers were able to safely bring down all those planes that day. To stand in the office before the screen with the light that shows every flight, then watching the lights going off as the planes landed safely -- sometimes 1, 2, 3 at a time -- it was extraordinary. Garvey is now Chairwoman of the Paris-based Meridien Infrastructure's North American operation. I will be at TRB and will be speaking on an invited panel that day so I hope to personally congratulate Garvey on this truly deserved distinction, which is being given by 16 state and federal transportation agencies as well as industry associations. I met Jane Garvey and her husband at a dinner party on Blue Hills Road in Amherst hosted by their neighbors, Professor Joe Balintfy and his lovely wife, Lily Lancaster, a few years after I joined the faculty at UMass Amherst. It was a poolside party. The Garveys have since moved from Amherst to Northampton (where the county jail is located). Professor Balintfy was one of my senior colleagues and his wife, who was completing her PhD in Management Science, was and is an amazing gourmet cook. At their dinner parties (I especially remember an incredible Valentine's Day dinner party) we would not only be the recipients of a delicious meal, but also have our calorie consumption and nutritional intake analyzed by Professor Balintfy's software. He was an expert on the diet problem, well-known to operations researchers and management scientists, and had developed elegant extensions that were sold to schools, hospitals, and even jails. I recall him telling us a wonderful story of how he had tried to sell his menu planning software to a jail in New Jersey but the warden there wanted to "minimize the prisoners' utility" rather than maximize their happiness and if they disliked grapefruit that is what he would serve them regularly. Congrats to Jane Garvey on her much-deserved recognition for contributions to leadership in multimodal transportation! It is amazing the people that one gets to meet in Amherst. Women Make News.com, based at the Centre for Social Innovation in Toronto, Canada. Women Make News.com is an editorial page for women where experts, advocates, and academics contribute editorials on important issues of the day. Its goal: to increase women’s participation in the public debate. According to its website, the percentage of women’s bylines in the major papers is only 10-15%: this site makes use of neglected female intellectual capital. I was intrigued and in checking out its website I found fascinating articles so I was delighted to be able to contribute my piece on The Price Paid by Women Who Serve: Gender Disparities in Academia, which the Editor had requested to reprint, and which had appeared earlier on this blog. As a further followup to this article on the Misra, Hickes Lundquist, Dahlberg Holmes, and Agiomavritis study, a female colleague, who is an Associate Professor, told me last week that she attended 35 additional meetings last year because of a committee that she was serving on. This added up, according to my calculations, to over a full week of work, and just for a single committee, for which she received no additional compensation and it took precious time away from teaching preparation and research! Some positive news on this front -- my colleague at UMass Amherst, Jane Fountain, was recently appointed Council Chair of the Global Advisory Council on the Future of Government by the World Economic Forum. Thanks to Amy-Willard Cross for educating and informing about so many important issues and for having more voices heard! Then again, she is based in Canada, where I was born! Let's get more females represented in forums from the World Economc Forum in Davos to TED so that society and technology can advance and the world can be made a better place for all! One of my doctoral students and I recently revised and resubmitted our paper, " Sustainable Fashion Supply Chain Management Under Oligopolistic Competition and Brand Differentiation" for a special issue of a journal. We became very interested in fashion supply chain management, since we had been working on time-sensitive products and fast fashion is an application of such supply chains. Our paper, "Fashion Supply Chain Management Through Cost and Time Minimization from a Network Perspective," will be the leading chapter in the volume, Fashion Supply Chain Management: Industry and Business Analysis, edited by T.-M. Choi, of the Hong Kong Polytechnic University, which is now in press with IGI Global and will be available in 2011. Having spoken on Financial Networks recently at the Measuring Systemic Risk Conference in Chicago , where there were a lot of very well-dressed bankers, regulators, and financiers, in attendance, I was amazed to see that UBS, the Swiss banking giant (probably due to the torrents of publicity), is relaxing its 44 -page dress code, which included even the allowed color of women employees' undergarments! Now their employees may even be able to eat garlic and onions and to select the color of their nail polish. Remember, folks, this is 2011! Speaking of women and fashion, my fellow blogger Laura McLay, brought to my attention a set of photos taken by Lawrence Harley "Larry" Luckham at Bell Labs in the 1960s, where he managed a data center. Note the number of women, their job titles, and their style of dress. I guarantee his set of photos will make you smile! Why are there now so few women in high tech?! 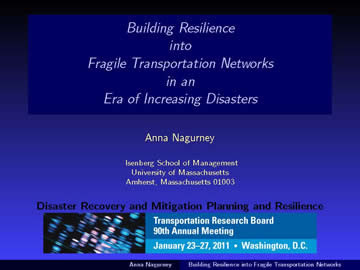 I have been busy preparing my panel presentation, entitled, Building Resilience into Fragile Transportation Networks in an Era of Increasing Disasters. This presentation will be given next week in Washington DC as part of the Transportation Research Board (TRB) meeting in Washington DC, at which upwards of 10,000 transportation researchers and practitioners from around the globe are expected to attend. Let's hope that the weather cooperates so folks can make it! My presentation is part of the Disaster Recovery and Mitigation Planning and Resilience panel. Joining me on this panel are: Jeffrey L. Western, of Western Management and Consulting, LLC, who will provide an update on TRB activities, Rae Zimmerman of NYU, who will be speaking on Infrastructure Critical Link and Cutting Edge for Disaster Recovery and Mitigation, Herby Lissade of the California Department of Transportation, who will present, Learning from the Haiti Reconstruction Efforts, and Sujith Kollamthodi, of the AEA Group in the United Kingdom who will speak on the U.K. Perspective. Pamela Murray-Tuite of Virginia Tech will be presiding at the panel. There will be time for questions (and answers) and I am sure that the discussions will be timely and fascinating! UMass Amherst has an article on this panel in this week's In the Loop. I was delighted to read this month's Feature Column of the American Mathematical Society (AMS) written by Professor John Malkevitch of York College of the City University of New York. The teaser to the article: How does a free market approach work when applied to road networks? The article discusses both the Prisoner's Dilemma and the Braess Paradoxis that illustrate that there are situations where, if individuals are left to make their own decisions, the result might be that as a group or as individuals they are worse off. The article cites the translation of the famous Braess (1968) paradox article from German to English that I did with Braess and my former doctoral student, Tina Wakolbinger (see the bottom photo above), and that was published in 2005 in the journal, Transportation Science. We hosted Professor Dietrich Braess in April 2006 at the Isenberg School and he spoke on how he came to devise the paradox, now named after him. He delighted us with his presentation (amazingly we were the first in North America to ever invite him to speak on this topic) and he stayed with us for several days. When I look at the photo above with many of the audience members following his talk it pleases me how many are now professors around the world -- from Dr. Dmytro Matsypura who is now at the University of Sydney (tenured) to Dr. Tina Wakolbinger who will soon be assuming her professorship at the Vienna University of Economics and Business to Dr. Christian Wernz who is a professor at Virginia Tech, to Dr. Shenghan Xu, who is a professor at the University of Idaho, to Dr. Zugang Liu, who is a professor at Penn State Hazleton, and Dr. Patrick Qiang, who is a professor at Penn State Malvern, plus Dr. Trisha Woolley, who is a professor at Texas Wesleyan University and Dr. Deanna Kennedy who is at the University of Washington Bothell. That year I was a Science Fellow at the Radcliffe Institute for Advanced Study at Harvard University and somehow still managed to help our students of the UMass Amherst INFORMS Student Chapter organize and host an incredible lineup of speakers in the Spring of 2006 and the Fall of 2005. The visit of Professor Dietrich Braess was one of the highlights and you can find more information about his visit here, with links to the translation and even the preface that I wrote with Professor David E. Boyce. I thank Professor Malkevitch for writing the Feature Column that brought back so many delightful memories! As for my most recent research on the Braess paradox (something I was even fascinated by in my doctoral dissertation at Brown University), see my article in Europhysics Letters on the wisdom of crowds. As the world marks the first anniversary of the Haiti earthquake that struck on January 12, 2010, with more than one million people there still living in tents and under tarps, I thought it important to write on how we can all learn from such catastrophic natural events and the ensuing response and reconstruction. As an academic, I conduct research, teach, and do (tons of) professional service. Since my general area of research is network systems, many of my topics stem from timely real-world events. Such an approach brings an immediacy to my work and also a dynamism to the classroom. Other research topics are generated through collaborations, including those with graduate students, whose dissertations I am supervising. Humanitarian logistics and the related theme of healthcare are two areas that I have been drawn to, beginning with the Rockefeller Foundation Conference on Humanitarian Logistics that I organized at its Bellagio Center on Lake Como in Italy. On the website that was created for this conference, I periodically upload additional studies of ours that may be relevant and of interest to this community. Below are some recent ones of ours. Supply Chain Network Design for Critical Needs with Outsourcing, Anna Nagurney, Min Yu, and Qiang Qiang, Papers in Regional Science, in press. Anna Nagurney and Ladimer S. Nagurney, International Journal of Sustainable Engineering 3: (2010) pp 189-197. Anna Nagurney, International Journal of Production Economics 128: (2010), pp 200-208. Anna Nagurney and Qiang Qiang, International Transactions in Operational Research, in press. Supply Chain Network Operations Management of a Blood Banking System with Cost and Risk Minimization, joint with two of my doctoral students, Amir Masoumi and Min Yu, which is presently under review. This latest paper is an outgrowth of specific interests of Amir Masoumi. It was particularly challenging because of the complexity of the network model, which had to capture the perishability of this time-sensitive, but life-saving, "product." This paper we plan on presenting at the POMS Conference in Reno, Nevada and at the Northeast Regional INFORMS Conference in Amherst! As for our critical needs supply chain network design paper with outsourcing, the Isenberg School has issued a press release on it, which may be accessed here. Why do some institutions, corporations, and organizations thrive and succeed while others fail? How do you make such systems at least as great as the sum of their parts? These are questions that I have been captivated by and struggling with this past year and two major conferences signaled to me that more research and analytics are needed to identify the right incentives to make organizations succeed. First, I attended John Birge's OMEGA RHO DISTINGUISHED LECTURE, ORMS and Risk Management Failures: What Are We Doing Wrong? that took place at the INFORMS Annual Meeting in Austin in November. As was vividly brought out in these and accompanying presentations and ensuing discussions: events contributing to the global financial crisis and the Gulf of Mexico oil spill appear to represent cataclysmic failures of risk management within some of the most technologically capable organizations. In retrospect, even the most basic analysis should have avoided these disasters and their enduring consequences. Why then did these catastrophes occur and what can be done to prevent such (and other) disasters? Clearly, these are system issues. As someone who researches and teaches about network systems, there is a striking difference in the outcomes under user-optimization, when individuals seek to determine their best allocation of resources subject to their own desires and goals, and those under system-optimization, in which the best allocation of resources so as to achieve the system's goals are determined. In transportation, we know that we can identify the proper policies, in the form of prices, as in the form of tolls, so that when assigned, individuals will behave in a way that is now optimal from a system (or societal) perspective. When we look back on financial disasters and institutional failures (or underachievement) there is often a misalignment between the stated goals of the organization and those of individuals who work for the organization. So, shadow systems evolve, in which individuals, think stockbrokers, and even professors, maximize their own utility and, as a consequence, the system is driven to states unreflective of its goals. Indeed, stockbrokers were rewarded/paid for not maximizing either shareholders' wealth or their firm's profits, but rather their own wealth, thus precipitating the financial collapse (and as Paul Krugman said because of malign neglect). Similarly, faculty at some universities are rewarded through additional financial compensation for teaching online courses over and above their regular teaching loads; in some cases, doubling or tripling their salaries. What then happens to the research output of such faculty? There are only so many hours in a day and a week and faculty may choose the risk-free option of teaching extra online. The stature of the school then suffers as research declines. Without the right incentives, or regulatory controls, shadow banks and shadow schools are operating, rewarding those who have the personal and political connections internally, and sacrificing the integrity and sustainability of the system. As a graduate student who is very observant recently said to me, "Why is the personal becoming professional? Shouldn't professional accomplishments merit the promotions and rewards instead?" Leaders of corporations and universities must identify the right incentives or face failure. Yesterday, Thomas J. White, a co-founder of the amazing organization, Partners in Health, and a very successful businessman in Boston in the construction industry, whose childhood was very painful, died at age 90. Today's Boston Globe has a very moving tribute about this great man, entitled: "Rich beyond counting with compassion for the poor." “I’m sorry I don’t have more money to give away,’’ he told the Globe in 2004. What he handed out had a ripple effect beyond the immediate lives he saved, said Dr. Jim Yong Kim, the president of Dartmouth College who was at the inception of Partners in Health with Mr. White, Dr. Paul Farmer, Ophelia Dahl, and Todd McCormack. He even delivered personally to a homeless woman in Harvard Square a red wagon a day after she told him that a red wagon was what she really needed to cart her belongings around. As we approach the one year anniversary of the earthquake that devastated Haiti on January 12, 2010, it is time to reflect. Dr. Kim's mother called Mr. Thomas J. White, a living saint. I think it’s important for us to live in an inclusive world. Excluding people for this reason or that is, in most cases, grossly unfair. I also think that the myth of the self-made man is exactly that, a myth. All of us are born under many conditions over which we had no control or no vote, i.e. where and when we were born, whether we were male or female, the color of our skin, our ethnicity, and our religion. Many institutions, including colleges and universities, produce an annual report. UMass Amherst just published its report on research entitled Research is What's NEXT which contains highlights of the past year from biofuels research to green high performance computing to the future of the Internet to different perspectives on economics, among other major research themes. 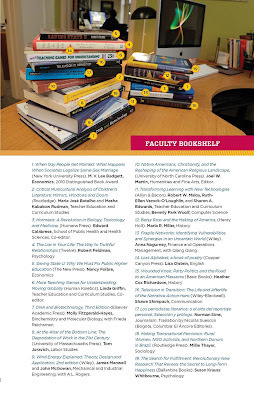 In the report is a page called Faculty Bookshelf, displayed above, on which 19 books are spotlighted, including, as number 13, my Fragile Networks book (Wiley), co-authored with Qiang "Patrick" Qiang, who was a former doctoral student of mine. Interestingly, 12 out of the 19 books have females as authors, including Saving State U: Why We Must Fix Public Higher Education (The New Press), authored by the economist and MacArthur Fellow Nancy Folbre, and The Search for Fulfillment: Revolutionary New Research That Reveals the Secret to Long-Term Happiness (Ballantine Books) by psychologist Susan Krauss Whitbourne. Interestingly, both Folbre and Whitbourne are fellow bloggers. Folbre writes for The New York Times Economix blog, whereas Whitbourne writes a blog for Psychology Today. Operations Research from Train Scheduling to Formula One Racing! I was delighted to read about the research of Professor Warren Powell (thanks, Warren, for the great holiday letter, by the way) and his team at Princeton University for Norfolk Southern Railroad in Wired Magazine. Their Plasma (Princeton Locomotive and Shop Management System) uses approximate dynamic programming to enhance decision-making associated with Norfolk Southern's operations, and predicts the impact of changes in fleet size, maintenance policies, transit time, and other key factors. The article on Transportation begins with "Model trains are easy to keep track of. But building a model to run real trains is a complex undertaking." Nevertheless, I could not resist featuring some of my husband's model trains, since he is an avid model train collector (as was his Dad), and some displays from the Amherst Railway Society annual show. Now, if the above hasn't whetted your appetite for algorithms and computer-based mathematical models in transportation,The New York Times is reporting that Ferrari hired Neil Martin as its Head of Operations Research. Neil Martin had formerly worked for Red Bull and was head of strategic operations for the Red Bull Formula One racing team. He has a degree in mathematics and computer science and another one in operational research (what the British call operations research). In a fascinating writeup a while back in The New York Times, Martin was quoted as saying: "Before I got seduced by Formula One, I was headed right into the city doing derivatives and share trading," he said. "And in a sense, this is completely analogous to it." "All we were doing was like in a financial portfolio, spreading the risk," he said. The article continues: But such decisions are based on data analyzed through millions of scenarios on computers that work not only throughout the week before the race, but during the race weekend and the race itself, as the team's results and those of the other teams are added. Such strategy started to become crucial in the mid-1990s, when refueling and tire changes were introduced, meaning that a car no longer ran an entire race on a single tank of fuel and one set of tires. The importance increased in 2003, after cars were required to start the race with the same amount of fuel that they had used in qualifying. That meant deciding how much fuel to use based on an expected grid position and on the ideal length of the first stint. The main factors fed into the computers are number of race laps, amount of fuel a car should carry, the car's speed and the duration of its tires, and what the competition is expected to do. With a new year come new resolutions, reflections, and a fresh start. I recently finished reading the book, "Composing a Life," by Mary Catherine Bateson, which I had purchased in my favorite bookstore at the Harvard Coop in Cambridge. In the book, Bateson, the daughter of the renowned anthropologist, Margaret Mead, writes about the creative potential of the complex lives that we live today through the prism of her own experiences, and those of four of her friends: Johnnetta Cole (a scholar and administrator), Joan Erikson (a dancer), Alice d'Entremont (an engineer), and Ellen Bassuk (a medical doctor). Interestingly, three of these women (Cole, Bassuk, and Bateson) had been Fellows of the Bunting Institute at Radcliffe, which is now the Radcliffe Institute for Advanced Study at Harvard (I was a Fellow there from 2005-2006). Both Bateson and Johnnetta Cole (who after being at UMass Amherst assumed the presidency of Spelman College) lived for a time in Amherst and even on the same street. Bateson was a faculty member at Amherst College and then became Dean of Faculty (but only for a relatively short time). In the book, Bateson mentions quite a few people that I know and speaks very highly of Esther Terry, who was a long-time faculty member at UMass, and even Barbara Osborne, a renowned biologist with whom I have served on several committees. What is remarkable about the book, is not only the insights into achievement, especially of females, who, inevitably, must deal with various life interruptions, but also observations on academia at large and the climate for females. Frankly, it seems to me that we are at a turning point. Despite more integration of females into academia (as well as minorities) I am seeing a decrease in diversity when it comes to administration at various institutions, including my own (although I do celebrate the female presidencies at such Ivy league universities as Harvard, Princeton, Brown, and UPenn, and even MIT, and, more recently, at UConn). (p.86): The academic world is notorious for the nastiness of the power games it plays, sometimes for such very small stakes. But in general, it is every man for himself -- unless the issue is one that threatens their common dominance. (p.98): A quote from Johnnetta Cole in discussing a general ed requirement that was the result of educational reform at UMass that she led: But by that time I think I had a pretty fair understanding of how things work in the academy. Some of the stuff was incredibly nasty, with all the things you know about and went through at Amherst -- distinguished colleagues grinning in your face and going behind your back and stabbing the hell out of you. Academic bullies, sadly, exist, and they may even be administrators who practice such tactics as exclusion, not sharing of information, hoarding of resources and picking the best of the crop (in terms of courses and remuneration for themselves). Realize that the academic world is not just your department. Noone gets "known" by just sitting in one's office (although at the beginning of your career you should definitely be seen a lot at your institution). Meet the top researchers in your field at conferences and at professional meetings. They have risen to the top not just because of their intellects but also because of their integrity. People invite those whom they trust both intellectually and professionally (and who are likable). Become involved in professional societies, agree to referee papers and to serve on journal editorial boards and conference organizing committees. Seek out successful "peers" that you can relate to (both within your institution and outside) and support one another. Balance your work life with family and friends and include some special interests in the mix (from exercise to art and music -- travel is a reward for success in your profession and will naturally come if you work hard). Keep your sense of wonder -- in the questions that students raise -- in the smiles that are shared and in the discoveries that you make and that you read about. Advocate for those that you see being discriminated against and, if you are one of them, speak out and document what is being done to you. Some universities have faculty unions and many have an ombudsperson. Be a mentor to students and junior faculty, who will most likely sense any negativity or unfairness. Students are much wiser than some faculty recognize. Congratulate those who have achieved -- kind words and acknowledgment can make a big difference. Recognize that academic envy can pollute collegiality and an organization's effectiveness and esprit de corps. Nurture other talents within yourself rather than engage in craving (rather than celebrating) other's achievements. They worked hard for them and deserve recognition. Each day is a new beginning with new people to meet, new papers (and books) to read and write, and new opportunities that fall into your lap -- take advantage of them, but do so wisely, remembering that we all have a limited time budget and need to allocate our resources wisely. And remember that even the Nobel Laureate in Economics, Sir Richard Stone, was marginalized by many of his colleagues before he received the Nobel Prize. So, do the best work that you possibly can -- in teaching -- in research, and in service and make sure that your conscience is clear and that you retain your integrity. Those that make the best leaders lead by generosity of spirit, integrity, reciprocity, and inclusion. Happy New Year for Business Analytics and Operations Research with Resolutions! I hope that you have recovered from your New Year's Eve celebrations and are off to a fabulous start of the New Year! Due to the blizzard of 2010, my family and I did not make it to NYC (and neither could many of our friends fly in) so we will not be attending the Salute to Vienna New Year's Concert 2011 in Lincoln Center with a ballet from Ukraine today, but my 92 year old uncle, who now lives in Manhattan, and was one of only three employees to show up at the bridge design engineering firm where he still works last Monday, will be there! So, instead of being in NYC, I began 2011 in Amherst with a big bowl of blueberries, Greek yogurt, and muesli, and a delicious cup of Starbuck's coffee (a Christmas gift) and settled down to checking my email when my attention got pleasantly diverted from all the e-list renewals by the blogpost, New Year's Resolutions from Dr. O.R. Field, by Dr. Mike Trick. I had reflected on last year's events in a recent blogpost, and, frankly, marveled at how many of the highlights were professional conferences around the globe where not only do colleagues reconnect and present their latest scientific discoveries but also exchange personal and professional stories and they do so in exciting venues. Mike Trick, in his on target post, written with a lot of wisdom and humor, in an interview format, nails the celebratory events of our profession and calls them parties, right in the spirit of the season! He writes: Look at the parties I throw every year (that is “professional meetings” when discussing reimbursements with department heads). The last party I threw in Austin drew more than 4600 people! I remember ten years ago I would hold two parties a year and be lucky to get 2000 at either one of them. Any (of) my European parties (and what parties they are!) are also breaking records every year. I concur and when I think of what I am looking forward to 2011 -- tops are the terrific conferences that will take place in 2011! Thanks also to Mike for bringing out the fact that females add so much to both the leadership of INFORMS as well as to so many of its fun and rewarding professional activities from panels organized by WORMS to one of my favorites at the annual INFORMS conference -- the WORMS luncheon (which is a must get-together for many of our PhD graduates, male or female). The success of Operations Research and Business Analytics is based on the discoveries, achievements, and accomplishments of its professionals, and the numbers (including students) that are attracted to it. The challenges facing our world today cannot be fully addressed nor resolved without the brainpower (past, present, and future) of our field. The downside of the blizzard and the transportation disruptions was that we did not go to NYC; the upside was that we stayed back in Amherst to a landscape of great snow-covered beauty and tranquility and I wrote a paper on a topic that I had been researching for over a year. All the pieces fit together from the theory to the algorithm and the numerical examples and I was able to show the equivalence between two network equilibrium systems in economics and ecology and the paper cites the first paper (on spatial price equilibrium) that I ever published in the journal Operations Research and it was with my dissertation advisor at Brown, Stella Dafermos. There is nothing like the "Aha!" moment, which makes one soar intellectually (and emotionally)! So when the going gets tough, go and do research!